Hi friend! I hope you’re having a wonderful week! I bet you’re not even a little bit surprised that I’m sharing another soup recipe with you given my deep and abiding love for all things soupy and delicious. As I mentioned last week in my Spicy Red Pepper & Carrot Soup Recipe, I’ve had an abundance of delicious, organic carrots come into my life and so I’ve been busy turning them into delicious recipes that I can batch cook and save for days when I just don’t feel like cooking. If you knew me as a child, you would probably be shocked that I’ve become the veggie lover that I have, considering I used to hide my carrots and broccoli in the giant fern in our kitchen when my mom wasn’t looking. Ever since it moved down to the sunroom and I stopped feeding it, it’s been looking a little haggard. Sorry friend! These veggies are now for me. 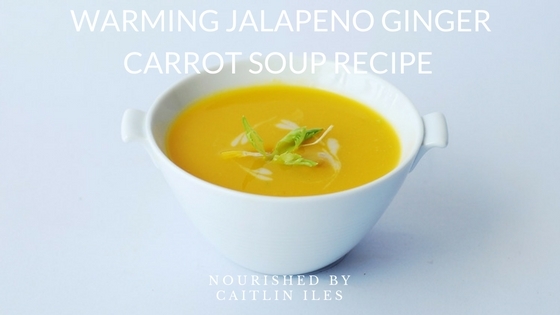 I’ve packed this soup full of immune boosting, delicious, and warming veggies like garlic, jalapeno, and ginger so that you can make a tasty side dish that will help you fight off all the colds and flus of the winter season. This recipe is sweet and spicy and the perfect dish to warm up a cold winter day! Add oil of choice and allow to warm for 30 seconds. Add onions, stir to combine, then cover. Let cook for 2-3 minutes until onions become translucent and slightly caramelized. Add garlic, celery, ginger, and jalapeno. Stir and let cook 1-2 minutes. Add carrots, stir, and let cook 2 minutes. Add coconut milk, broth and sea salt. Cover, turn to high heat, and bring to a boil. Once boiled, reduce heat and let simmer, covered, until carrots are softened, about 25 minutes. Remove from heat, puree to desired smoothness and return to heat. Add balsamic and let simmer 3-5 minutes. 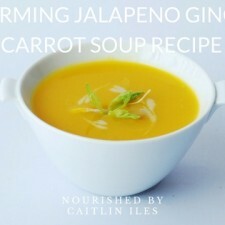 Well friend, there’s another warm and cozy soup recipe to see you through to spring. And if you’re looking for extra help to change your lifestyle make sure you download my FREE Stop Self-Sabotage Workbook that’s full of exercises and information to help you achieve your health goals.